Some excellent runs this weekend by our Junior men trying longer courses for the first time at Storthes Hall. Alex Robinson was 15th on Black and Matthew Rochester was 11th on Brown ( they had run out of Black maps). Ruth Ker was 1st W50 on the Green course and 5th overall, which made her W50 Yorkshire Middle Distance Champion 2018. If you plan to do this event, save a few pounds by getting your entry in before the first closing date which is Wednesday 31st January. Organisation is now well advanced to deliver some excellent courses and a memorable visit to the Lakes this summer. And don’t forget there will be an urban street race in Ulverston on the “rest day”. All can be entered via Fabian by clicking here . Sun 18 Feb – SYO Rgl YHOA Suplge Tankersley Entries close 4th Feb.
Richard Kirk has now found 6 volunteers for planning the next series of event in the winter starting this wednesday. Next event is the 7th February from Cheltenham Mount. Details are below and include a new location for what hopefully will be a delightful spring evening for the last of the series. Last price hike was Sunday 28th Jan. Entries close on the 25th February. And the final is much closer than last year. No local races this weekend. The only result I have found was for Ruth Ker who was the fastest on the voided Edinburgh city race despite losing her dibber and having to go back to relocate it. The race was voided due to ice on the course you can see some on Anthony Udris’s headcam video here. YHOA League Presentation and Alistair Tinto Memorial event. Mugs for the YHOA Superleague 2017, YHOA Urban League 2017, and YHOA Night League 2017/2018 will be available for winners, seconds and thirds in each class of the leagues. 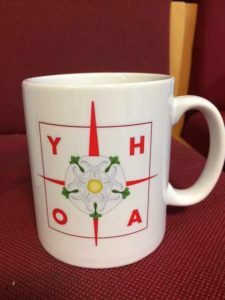 Mugs are only going to orienteers from YHOA clubs who have completed at least 2 league events. The full list of winners is on www.yhoa.org.uk. There is still one event to go in the Night League so places in that competition are not finalised yet. Mugs will be awarded at the EPOC Alistair Tinto memorial event on Jan 28 at Storthes Hall. This is also the YHOA Middle Distance Champs and the first YHOA Superleague event of 2018. Mugs go to winners, seconds and thirds from the leagues who go to the event on Jan 28. There will be a place near registration/download where those entitled to mugs should check in so that we know who is there to receive them. There are a number of Claros who have qualified for mugs so congratulations to them and one Claro who needs to race in the last race to qualify. Don’t forget to renew your membership. It is now due. A number of regulars are still showing on the BOF lapsed members list. Richard Kirk has now found 6 volunteers for planning the next series of event in the winter starting this Wednesday. Next event is the 24th January form the Black Swan at Burn Bridge. Details are below and include a new location for what hopefully will be a delightful spring evening for the last of the series. The next price hike is Sunday 28th Jan. Save yourselves £6 for the 3 entries by getting your entries in now. Claro cyclists did very well at the first NYMBO event of the year. Tim Evans was first Vet and first overall with 424 points. Adrian and Luke Parker were second overall and and first generation team with 415 points. Jemima Parker and Jo Anderson were first Ladies. On Sunday Ruth Ker was 2nd lady and 9th overall on the Blue at Rivelin. Liz Potterton was 9th Lady on Green and Richard Corfield was 4th on Light Green. All club members should have had an email last Sunday requesting help for the junior event on the 27th January where we may have over 200 Junior Soldiers trying out Orienteering. Thank you for those who have volunteered so far, more volunteers would be welcome for a 2 hour shift between 10:00 and 14:00. If you can help please e-mail news@claro-orienteering.org.uk. If you are a club member and haven’t had the e-mail please can you advise as this means out contact system needs updating. A number of Top 10s at Temple Newsam this weekend. At the night event David Day was 4th and Tim Evans 8th on the medium and on the following days event ( on a 98% different area) David Rochester was 1st on Light Green and Toby Rochester was 1st on Orange. Don’t forget to renew your membership it is now due. A number of regulars are still showing on the BO lapsed members list. All club members should have had an email on Sunday requesting help for the junior event on the 27th January where we may have over 200 Junior Soldiers trying out Orienteering. Thank you for those who have volunteered so far. More volunteers would be welcome for a 2 hour shift between 10:00 and 14:00. If you can help please e-mail news@claro-orienteering.org.uk. If you are a club member and haven’t had the e-mail please can you advise as this means out contact system needs updating. EPOC are hosting the YHOA Middle Distance Championships and a Superleague event on January 28 at Storthes Hall. It will also be a memorial event for Alistair Tinto. Many of you will have known Alistair and also know how much he did over many years for EPOC and YHOA. Obviously all are hoping that the event will be a popular and successful one when we can remember Alistair as well as enjoy our runs. Unfortunately, there is now a clash with a nearby attractive event. DVO had to cancel a National event on Eyam Moor on 10 Dec and it has had to be rearranged as a Regional event on 28 January. DVO have considered moving it to another date, but they are very restricted and it has to stay on January 28. Pre-entries from 10 Dec have been transferred to the new date and there were many YHOA entries. With the date change and the clashing EPOC memorial event, DVO understand that some people will wish to cancel their entries and get a refund. This is possible up to Jan 2 though there will be small administration charge. Pre-entries to the DVO event should have received an email about this. Obviously we hope that all YHOA members orienteering on that day will choose to go to the EPOC event. However, we do understand that those who already have an entry for the DVO event and/or find Eyam Moor an attractive alternative, may still wish to go to that event. The clash is unfortunate, but please understand that DVO and EPOC have tried to avoid it. The EPOC event can be entered via Fabian4. It is cheaper than the DVO one, and nearer for most. Hopefully, there will also be awards at the event for the 2017 YHOA Superleague and Urban League. Richard Kirk has now found 6 volunteers for planning the next series of event in the winter starting on January 10th details are below and include a new location for what hopefully will be a delightful spring evening for the last of the series. Some of you may remember the link to Sandor Talas’s blog about IOF finances last year. His slightly lighthearted comments that virtual orienteering may be the best chance of Orienteering making the Olympics is here. Oh and if you thought esports was not for the Olympics his follow up is here. For those looking for some local Orienteering to kick off the new year Aire have two events at Temple Newsam this weekend, a night event on Saturday and a regional event on the Sunday . The number of competitors at the Junior Events is normally between 10-20 and only requires a few helpers to run the events. However, we have been asked if we can accommodate a few army trainees so we will be asking for helpers for this event , more details to follow when they are finalised. You may wonder why these are linked. In the November edition of the BO e-news there was a reminder that your membership is due for renewal. Please remember to renew as soon as possible, the first price hike for JK 2018 was the 17th December and I think you need to have renewed your membership to enter; you did in previous years. Details are here . The next price hike is Sunday 28th Jan. Save yourselves £6 for the 3 entries by getting your entries in now. At upcoming events you may start to see some new map symbols and new control descriptions, see the warning on the Skipwith Common details. Firstly, earlier this year a new specification for orienteering maps know as “ISOM 2017” was published, which replaces the previous “ISOM 2000” standard. Most changes are minor and you may not even notice, but a few you will (such as the marking of boulders, platforms, rides and distinct vegetation features). The full specification can be found here, but Berkshire Orienteers produced a much simpler comparison sheet to help you understand, see here. CLARO have already been updating our maps when we next use them for an event, and other clubs are expected to do likewise. Note these changes only apply to forest/moorland maps. Sprint/urban maps are unaffected (they have a different “ISSOM” standard). Secondly, the IOF have also just published updated specifications for pictorial control descriptions, see here. The changes you are most likely to notice are moving the “bend” symbol from column G to column F, and new symbols for “trench”, and “out of bounds area” (most likely used for a flower bed in an urban/sprint race – that is what the symbol depicts anyway!). We will start using these as soon as Purple Pen supports them (the course planning software we use).